As the great citizens of Great Britain, the British, say, "This is pants!" They say that whenever something is not so hot, not so good, not so fresh, not so desirable. Bad steak and kidney pie? Total pants! Late double-decker? What pants! Really uncomfortable pair of pants? ...well, I don't know what they say about those. As for me, I am calling this game "pants". 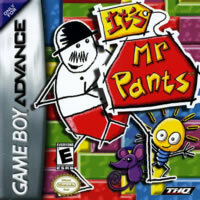 To make matters even more interesting, this game has the word "pants" in the title — and the game was made in Great Britain! This is what we call "coming full circle". And It's Mr. Pants is what we call "a pants game". It's Mr. Pants is the puzzle game that time forgot, briefly remembered, then staunchly avoided. Developed by Rare, the fine blokes who brought us such classics as Banjo-Kazooie, Donkey Kong Country, and the unforgettable Digger T. Rock (sarcasm to be noted on that last entry), this game actually has nothing to do with pants at all and more on simply making blocks disappear. 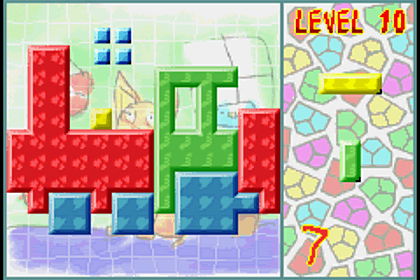 Basically, your goal is to make all of the blocks on the screen disappear by combining them with other, smaller pieces of different shapes and sizes to form rectangles of 2x3 or larger, at which point they dissipate into MacGuffin World. That may not sound exciting, but keep in mind that in pretty much every game of Tetris, you're making a line of blocks disappear, and I'm not hearing much mass disapproval of Tetris. *opens window; listens outside* Nope. I don't hear anything except a couple arguing over insufficient bus fare. The game is divided into three different modes of play (plus a fourth unlockable mode). First is Puzzle Mode, where you're given a limited and predetermined set of blocks, doled out one at a time, to paste wherever you like (provided it's not on top of another block of the same colour). Pieces come in various familiar shapes, like Ls, squares, and, uh, smaller Ls... that can be rotated to suit your needs. Luckily as well, you can use blocks of other colours to separate larger pieces and, if they are large enough, will disappear on their own. While there is no posted time limit on these puzzles, you have a limited amount of time to place each piece before it simply plops itself down wherever it's hovering. Only by clearing the entire board are you given the thumbs-up for success, and there's typically only one solution that works. The first few boards are rather easy. Beyond that, GameFAQs may become your new best friend, beating out Todd, the local boy that sneaks ice cream bars from his mom's fridge for you. This is the most playable mode, and also the mode which will be the most played, because the other two are, well, "pants". I'm playing as an extremely thin man standing around in his undergarments. So, me, basically. Wipeout Mode gives you a time limit of two minutes, during which time you'll be given unlimited extra blocks to try and clear a board smothered with a strange smattering of random block formations of multiple colours. It's especially difficult, given the haphazardness of the blocks that turn up; they rarely work in your favour when you need them the most, and you end up spending more time making that one last set of blocks bigger and bigger but never quite being able to make a full-on rectangle before the timer destroys your hopes and dreams. 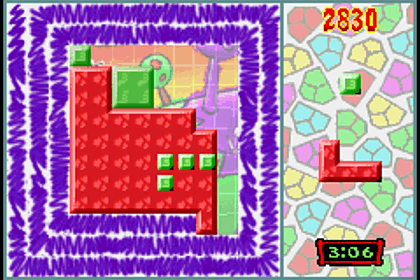 Marathon Mode is even more challenging: you're asked to clear as many blocks as possible as a weird scribble-dabbed snake winds its way around the screen, narrowing your field of play as it slithers. (And I say "slithers", but it doesn't really slither so much as appears block by block with little fluidity.) Neither of these modes are significant fun for more than a few minutes; Marathon Mode is barely fun for more than one, as there's little reward for your heart-stopping efforts. Completing Puzzle Mode (a feat reserved for gaming flagellants) will unlock Max the Mouse's Mystical Muddle Mode, where our good rodentia buddy Max will ask you to prepare certain specific shapes within a set timeframe. Failing to do so will give you a swift Game Over, as well as the freedom not to play any longer. Observing the art style alone, the game looks as though it was drawn by a group of Kindergarten students. Turns out, however, that it was actually drawn by grown men, likely those in plaid shirts with pizza sauce dribbling down their faces and clinging to their ever-protruding chest hairs in tangy rouge droplets. It gives the air of a game for children, but I can assure you that kids will likely call this game "pants", put it back on the shelf, and go microwave some Totino's pizza rolls or something. Mr. Pants himself, already a ridiculous mascot meant for purely humour's sake but more accurately representing one's lack of ability to create a legitimate mascot (and probably should not have tried), is a stick man with a snappy bowler and probably equally "snappy" underwear. He'd be arrested if he wandered out in public like that. I understand that Rare was trying to go for something different — or perhaps they were trying to salvage what was left of a puzzle game already in development, Donkey Kong Coconut Crackers, before they were gobbled up by Microsoft in the second most newsworthy takeover of 2002, right after Yahoo! ate "Hotjobs.com", which probably turned a few more heads. I'll give them credit for trying something new, but I won't give them as much credit for It's Mr. Pants resulting in such a lackluster outing that will deter all but the most insatiable of puzzler fans. To them, it'll be as enticing as putting on a brand new pair of toasty socks. To me, however, it's merely pants.